Edgestar wine cooler is a built-in compressor cooling wine refrigerator with a bottle capacity of 166. We hope that you are already comfortable with compressor cooling and thermoelectric cooling wine fridges. In this review article, we will only talk about the EdgeStar 166 bottle wine cooler. 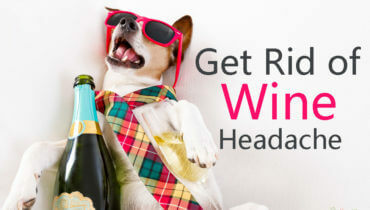 If you did not already read our latest article that presents amazing wine cooler tips and tricks, then please read it first. Nippywine considered technical and other performance criteria based on the available information. Moreover, during the review of Edgestar 166 bottle built-in wine cooler, we have good marks due to its brand value. Fewer complaints and other individual criteria pushed the score up. Also, we took into consideration of negative issues that affected the review adversely. The opinion here is purely independent and subjective. The above advice can also deteriorate depending on updated information and customers’ value. Edgestar is one of the two products from a very renowned company ‘Living Direct’ which is an online retail company mainly concentrates on consumer appliance, indoor and outdoor types of furniture etc. Hence, the company and its two brands are very well famous products among the America. No one can leave any adverse comment on behalf of this product. This wine cooler is ideal for wine with a temperature ranging from 40 to 65 degrees. Read our wine temperature guide to justify your primary choice. Also, you will get a cooler with tinted UV protection glass in order to prevent any fault which we have discussed in our previous article. It is 24 inches wide so, you may keep it in one corner or anywhere it fits. However, this chiller fits as a freestanding version and also as a built-in version. This is a warm recall that only those built-in refrigerators also work as a freestanding version when air circulates from the front. Here we give a big thumbs up for that. Unless you need keep free space on another side. You do not need to worry about uneven cooling due to the existence of smart technology. Even cooling features ensure the cool air reaches in each corner so that the tannins remains same as previous. Even cooling works great if the shelving pattern is flexible. This awesome layout helps to put the maximum number of wine bottles. The estimated quantity of 166 bottles represents the Typical Bordeaux bottle. So, you should never worry about the bottle size. You need to think about a safety lock when, you do not want anybody else to access your vintage collection. Furthermore, a safety lock helps to protect the bottles from kids and high volatility of inside temperature. Wine fault often occurs for two reasons. One’s carelessness and the other is chemical reaction during the manufacturing of wine. However, the carelessness includes heat damage. It occurs when the bottles come closer sunlight. Also, in contact with heavy sunlight the cork may come out of the bottle. It happens due to the generation of inner gas. This wine cooler comes with the Tinted UV protected glass within a very reasonable price. Special Note: If you are wondering for a dual zone wine cooler, Read the review of Edgestar CWR1551DZ. Often we encounter several wine faults when we cannot set the ideal wine temperature. Not monitoring the temperature regularly wine may become faulty. The problem also occurs if electricity shuts or the electricity is unplugged. Automatic temperature control helps to restore previously set temperature anytime when electricity comes back. Least likely 1% of the prevailing wine coolers offer such flexibility. You can easily shift the door direction from right to left or from the left to right. It gives you another ease of access and also fits the cooler anywhere. Often compressor cooling creates more noise and vibration. Wood-trimmed wine racks preserve the vintage babies with an extra level of careness. It protects any scratches on the label and reduces noises from the vibration. ETL is a product testing and certifying body. of any product is ETL approved, it means the products have met the all regulatory and safety guidelines. As per development proposal made by (Office of Energy Efficiency and Renewable Energy, Department of Energy.) 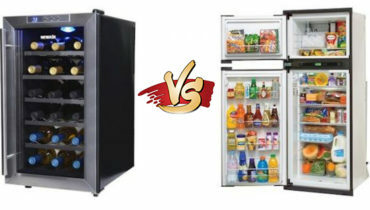 at April – 2016, wine coolers or any beverage refrigerator which is not the typical refrigerator, requires considering under energy conservation program for consumer products. This wine chiller from edgestar is very smart in power consumption and has achieved full marks on this criteria. It often create a big mess when keeping an already opened bottle. There are many users who feel comfortable to keep the bottle vertically. Removable shelves will allow to manage that part if necessary. Like all other electronic products, standard warranty provisions are applied depending on various facts. Please visit seller’s’ page to get more info. Dual-pane glass door indulges better control of temperature. the unit maintains temperature well and cools down very quickly after opening it to retrieve that next bottle of wine. In any need of changing the carbon filter, you can do this easily from the seller. Standard provision will be applied at the point of transaction/replacement. Unlike some cheap electronic products/wine coolers, you will be able to see 6 feets long electric cable that offer you the ease of settling down. Our internet research (fb, twitter, and other social media) suggest that the seller has ethically presented the information. Not a single negligible percentage of customers complained about the advertising ethics. It does not fit the wide Shiraz bottle very well. This fact somehow downgrades the rating. From the all available information, physical testing and other qualitative issues the wine cooler serve everyone’s intended purpose. Hats off to the seller for advertising what exactly they deliver. We believe to offer you the best assessment report. You can undoubtedly buy this product. If you feel any part of this review article needs changing, or if you would love to add some additional notes, feel free to contact us. We will always welcome your thoughts as a learning material. 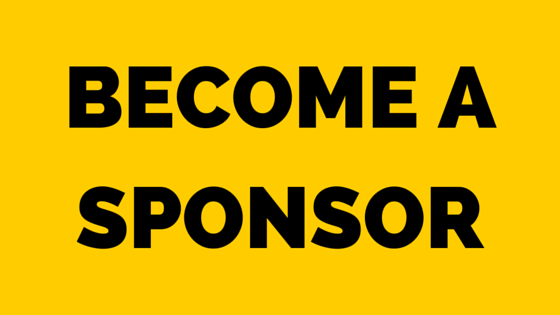 If you like to feature your own product in our blog, Please read the sponsoring scheme and guest posting. To accommodate bigger bottles that you will get rid of a shelf, remember that this can decrease the said bottle capacity. The glossy metal trim door, soft LED interior light, and timeless slide-out timber trimmed shelves offer a more classic design to showcase your cherished collection. No matter the surroundings, these components are guaranteed to spark conversation in their attractive and gratifying aesthetic. One of probably the main aspects of a cooling system would be your controllers. They ought to be accessible, readily known, and supply you with accurate info on the specific temperature you’re trying to realize. The instinctive touch controller and electronic temperature display let you quickly correct and track the desired temperature based on your own unique cooling needs. UV beams can result in a plethora of issues for virtually any wine assortment. Along with supplying undesirable warmth, which places obviously strain in your heating, exposure to UV light may alter the chemical makeup of one’s wine, potentially influencing taste and maturation. The tinted glass doorway helps to ensure if the bottles of wine are observable, the ethics of one’s wine is shielded by the possible injury of unpleasant lighting and UV rays.This shelf design will permit one to reach the most bottle capacity centered in an ‘Average Bordeaux’ jar. It’s silent; you could hear it twist if you are listening but it isn’t loud or annoying plus it’s limited to 30 minutes in the maximum. That is dual zone, even if you’re thinking about keeping reds at the very top, this can be designed for whites, then underneath portion might be redeemed set high or low enough for reds and whites. That means you’re able to set the temp low to be for white wines, however, perhaps not entirely all for reds. Hope this makes sense. The exact bottom tray is merely an excess tray that’s the place I put in other reds along with also my champagne. The diameter is created to your standard size bottles of wine; champagne fits at the exact bottom row. Good price, purchase. Please let the refrigerator to place simmer at least two full weeks before hammering, each of the guidelines. Please make sure you adhere to along with following guidelines. The machine has to sit twenty-four hours before running. This is a similar dependence on all appliances which have coolant. Before slipping in to position get all essential data from the rear of the system to enroll it. After the system is onto it generates considerably less noise than many small and huge refrigerators. We usually do not hear it in the case at additional room or higher casual dialog. So far it is a good product. Full of features and a stylish design that particular wine fridge is a favorite choice which could perfectly blend into almost any interior decor. This wine fridge’s space-saving layout and 1-2″ breadth helps make it the right fit for just about any tiny under-counter area like a place formerly inhabited by a garbage compactor. Front venting enables flush-with-cabinetry, or under-counter installation as the fully finished black cabinet allows for rapid usage, too. I’ll not need to worry about hot spots or uneven cooling on this particular unit as a result of the influential flow enthusiasts, which assist the compressor in dispersing cool atmosphere throughou evenly. This wine cooler features a large temperature selection of 40-65°F, which makes it well suited for several wine types. This cooler perfectly matches the distance of a garbage compactor – providing just a tiny space all over for venting. It’s nearly always quiet. Sporadically, the heating starts-up and there’s a mild hum (a bit louder than typical icebox). Eradicate any space at home with storage for your entire own wine necessities. Designed to support the tightest software, the EdgeStar 6-Inch built-in wine bottle chiller (CWR70SZ) supplies a 7-bottle capability to continue to keep your cherished wines chilled for most occasions. Addition to streamlined apartments kitchens and homes will transform the tiniest of areas into the wine nook that is perfect. 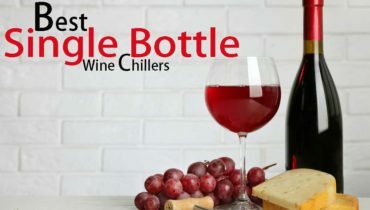 The EdgeStar CWR70SZ Wine Bottle Chiller provides an adapting temperature Assortment of 40-65 level F so that you can save a Range of wine kinds in their best functioning temperature. Perfect addition to kitchens that are crowded, miniature homes and streamlined flats, this EdgeStar 6-inch width can change the tiniest of spaces into the ideal wine nook. This wine cooler is High-efficiency compressor along with inner flow enthusiast guarantee the cupboard’s inside is equally chilled, Without Any warm spots Digital Control Panel: Together with the digital-touch control panel, so you can quickly fix set the place temperature in Addition to toggle the blue inside light. Store your prized bottles understanding they are protected, protected from damaging mild; this device’s tinted glass door contains black dots that help stop undesirable damage caused by ultraviolet rays. Above article only focuses on Edgestar wine coolers. So far we tried to pick the best products for you. The assessment may not become updated at your date. Please let us know if you see any dissimilarities among the information. 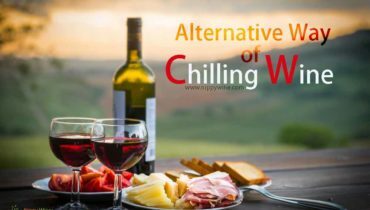 You can also read our latest publish on wine chilling alternatives that contains some free methods, tips and the review of single bottle wine cooler.